Yes, really. If you've watched how judging works, this is exactly what would have happened. When Fernandez was considered second best (like with his performance at the Olympics) he was placed 4 points behind (Unless you consider that "close for excitement" which I can't help). The judges would have clinged onto Chen's inferior quality if Yuzuru had delivered, his place is still second in the judges' eyes, but very close. He hadn't even exceeded 45 PCS before this, IIRC, and even here he couldn't even cross or approach 110, which is where Yuzuru would have been with the 4S. That's already 3 points while still considering the judges doubting his ability to deliver in the LP. The momentum within events has always worked like this. Not really. Yuzuru would have taken the lead but judges still might have inflated Nathan's SP score so that the fight between two of them in FS would more exciting. I agree with the latter. Potentially, Yuzuru with the same ( or almost the same ) BV should have the egde over Nathan because he is superior on every aspect. But realistically with Chen getting amazingly high PCS and GOEs, both of them is nearly equal. After reading the blog post of ecovail, I just realized that not just Yuzu but all the men competing with only stable quad toes or sals are in a disadvantage. Even if a skater has both toe and sal but the competitor has quad lutzes and flips unless underotated (and yeah we know they are not calling it) , the lutz and flip of mediocore GOE (say 3) can still be equivalent or higher than magnificient toe or sal. I was initiall thinking if you get all 5's it will be like: quad toeloop: 9.5+5=14.5 but in reality 9.5+4.75=14.25 Mediocore GOE: quad Lutz: 11.5+3=14.5 in reality 11.5+3.45=14.95 Its really saddening because some of the guys that I also like watching only has either the Sal or Toe. Now they have to pressure themselves too. So what was the ISU saying that this system awards artistry? If it was the case then why double the perks of difficult jumps? The higher base value plus hgher GOE equivalent? They should have just increased the BV of spins and step sequences then it would have been more related to artistry. But what's done is done right? Under the new rules, the BV difference between 4Lz and 4T isn't just the BV points, but also the inherent GOE scaling potential (which got widened by the +5 system). In other words, on paper, Yuzu's FS BV might only be 3 point less than Nathan, but under an all clean situation, due to 4Lz scales higher than 4T, the inherent BV difference is closer to 5 points. Add the fact the judges are clearly adding brownie PCS points for successful 4Lz, the difference is even greater. I think this is what Yuzu is referring to, that the inherent BV difference has been enlarged through GOE/PCS under the new system. I don't think Hanyu didn't realise he had to raise his BV to win until Worlds. That is why he added the 4Lz in the 17/18 season and was planning to add the 4A in 18/19 - he was never going to let Nathan run away with BV advantages but injury totally got in the way. Nathan is not the impetus for him to keep improving (as some NA fans like to claim), Yuzu has always been upping his technical arsenal every year long before Chen came. This season he was the only top skater to actually introduce something new - the 4T3A. I do think he held out a small hope that if he goes clean, his PCS might make it (since given his injuries, it wasn't possible to add BV prior to Worlds) - only to get the shock of how much the judges was willing to raise Nathan's PCS out of nowhere. Him participating in GPF wouldn't make a difference to BV or assisted in understanding the judging more because Nathan was a mess at GPF (he scored much lower than Hanyu's usual GGF scores & GP Helsinki). Honestly, if Yuzu hadn't been injured, barring some weird mental breakdown, he would have won GPF based on how other men fared. Him participating and winning though could have at least slowed down the PCS growth for Chen. The scores at USNats wasn't supposed to happen in ISU competition anyway so maybe that's why he's still sure he can beat that skates (Nathan going mostly clean) with his lower BV program. However as we can see at Worlds (and WTT), judges do have their ways of scoring that bizarre the hell out of us (and him). It would have help if he was able to compete with a pretty clean Nathan in GPF just to see how the judges was scoring them together in the same competition. However, Nathan wasn't able cleanly land most of his jumps at earlier ISU comps as well so he might not have guessed about the GOE range and how it have a lot of effect. IMO, it's like when you study for exam, GPF is like midterm exam where you get idea of how your teacher like to questions and how much they score you for how you answer them. So Yuzu skipping GPF was like going into final exam (aka. Worlds) with all the knowledge you have been study but not a glimpse of what will be asked. So he guess the question wrongly and wasn't prepared for that, therefore missed the mark. About the injury derailed his plan for Tech improvement, I think he was thinking about this even before OWG 2018. After adding 2 quads in SP and 3 quads in FS in 2015-2016, he added 4Lo from 2016-2017 and 4Lz in 2017-2018 cause he was sure that upping the Tech BV was gonna be necessary in the future (just luckily not by OWG'18). He know his advantages in PCS will disappear one day when the younger ones get better (cause they will get better) so in order to have an 'absolute win' where if everybody else go clean, he will still wins, he needs the BV. It's just that the injury from 4Lz in NHK causing him to go backward and have to slowly gain his quads back and still not able to do 4Lz in 2018-2019 seasons. And with this season that the 4Lo also set him back on his quest to pursue legendary 4A again. I think now that he know how the landscape is, I'm sure he's looking for ways to be able compete and wins with the skates that he's proud of. Just hope that his ankle and body will grant him his wish to fulfill them. Well, if Yuzuru had gone clean in the SP, they'd have inflated Chen's score less and given Yuzuru the lead after the SP. He'd have had more momentum going into the LP, letting him get away a little more with the same scratchy landings he had there, and Chen would have been the "only if Hanyu falls" replacement. Would have won. While it is true that more BV will give him more ground for mistakes, I'm not sure what the momentum aspect of an event will do for him or anyone when a (big) mistake does happen. Chen and Hanyu are considered nearly equal at this point, and they don't care if one fails, because they'll have the other (although when both clean, it will be Hanyu). Chen's momentum can be quelled a little if he's beaten at the GPF again (he's had a free ride for two seasons now), and even more if he places below second there. I always wonder if the skaters know that the judging is bogus. Then lol. Even if he'd been placed second technically, they'd never have put him below Tim on the artistic mark, giving him the first place in the LP. Hanyueconomy! At this point now it’s just posting random stuff until he reappears yeah? So, please correct me if I’m wrong bc that translation was a little confusing to me. From what I previously understood, he was impressed by Nathans’s current National Championship results, but it wasn’t until actually competing with him at Worlds that he came to the realization that he had to raise his base value in order to win. Is this correct? And, if he hadn’t had an injury that sidelined him and would have allowed him to compete at Grand Prix Finals, he might have understood this sooner? (my interpretation). 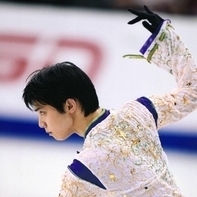 All, I know is that he is a breathtaking skater with grace and majesty. I broke down and watched Nathan’s Worlds FS today for the first time and was so disappointed. It was so awkward especially his hands at the end, the music reminded me of Patrick’s blah choices and the costume looked like a two piece Under Armor Training outfit. Then, I made the mistake of reading the comments from his fans. Yet, this interview has given me hope that even though I thought Yuzu understood the impact of the new judging system, he really understands it now. Im excited to see what he does with this new understanding. I guess I just thought he had someone to bounce his ideas off of that would have pointed out the new GOE/PCS issues. Anyway, he’s the GOAT, and I’m excited he’s taking on the challenge to once again raise the bar. I’m praying for his ankle, knees and back and hope he finds the way to make himself happy again with his performances. Any other insights would be appreciated especially if I misunderstood the translation. He was talking about the ordinals and how since Plush was 4th in the SP, Yagudin could afford to be 2nd in the FS. At first he was just saying that he was conceding the LP to Plush. But then Yagudin watered down his program some more and Scott started going on about how he can't concede the long program to Goebel or he could lose. Scott definitely thought Yagudin might lose the LP to Goebel. But he was talking about their style, not being cautious vs assertive or whatever a better word for it is. Both pairs skated with "attack". Not sure about this one, but I also think he completely ignored the mistakes made by G&G and their lower jump tech. The seeming implication was that G&G were perfect and if M&D won, it was because the judges just liked them better. Looks like Rika continues her adventure with boots. https://ameblo.jp/ecovail/entry-12455638484.html A good translation of this interview...I didn't totally understand it previously but now I do. Yuzu's mindset before and after Saitama and how he thought he could win with two clean programs but came to the realization that he couldn't because of the way GOEs are awarded in the new system. I don't have any specific comments to add right now, just wanted to express my approval of Scott Hamilton being the first person mentioned in this thread. I'm not exaggerating when I say that some of his disrespectful antics have literally made me feel ashamed to be American, he's that bad. Lol. Is that Nam leaning in for a kiss? Hahaha! Yuzu is such a cat! Is the other guy Nam? That reminds me of my son too. His waist is small too and for a 190 cm guy, when the jeans fit at the waist, the length is too short; and he has to be reminded of getting his hair cut too! Some super expensive jeans do fit, I agree, but maybe that will be a once a year thing. As for the thighs being relatively muscular for the waist, husband had the same problem when he was running middle distance competitively.